Arabic grammar is made up of mainly two branches, i.e. Nahw (syntax) and Sarf (Etymology and Morphology.) Numerous books are available in English on the former subject (Nahw) Not many are available on the latter subject (Sarf). This is why the author has compiled a formal textbook in the English language, exclusively pertaining to the latter subject (Sarf), elaborate, replete with examples and exercises and written in a style which the Darul Ulooms (Islamic Colleges) usually prefer. 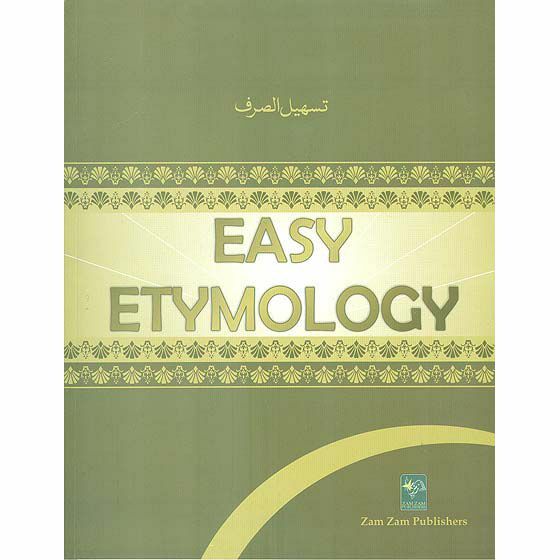 Easy etymology is a simplified, concise, grammar textbook aimed at beginners in the study of the Arabic Language. A special feature of this work is that each chapter has been divided into 5 sections. viz. Vocabulary, Definitions, Paradigms, Laws and exercises. This facilitates easy learning for students. Between two to five new words are introduced in each lesson and these words recur throughout the text. It is expected that the pupil will assimilate over a hundred basic Arabic verbs as well as their multiply varied forms. Laws are introduced gradually and a step-by-step explanation is provided for their correct usage.